The asteroid impact that killed off the dinosaurs is very relevant to current global warming predictions because it was an event that resulted in an extremely rapid increase in atmospheric CO2, in particular because the impact zone had high levels of carbonates in the rocks. The widespread bush fires had a similar short-term effect. Investigation of this phenomenon obviously requires a reliable method of measuring both historical temperatures and CO2 concentration. There has long been speculation on the extent of the former which now seems to have been resolved by studies of fish teeth, bones and scales from rocks laid down at the time of impact in what was the Tethys Sea but is now part of Tunisia, as reported in the New Scientist. The standard way to measure historical water temperature is by comparing the ratio of oxygen isotopes in the teeth etc. A temperature increase of 5°C is fairly reliably established by these studies. 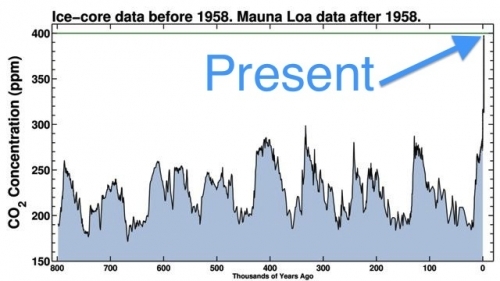 Many current climate models would indicate a CO2 concentration of 2300 ppm would be required for this and indeed the tentative results of a 2004 study of fossil leaves did indicate that might be the case. However fossil soil studies have more reliably concluded that the CO2 concentration was more the order of 1000 ppm. If these results are correct it could mean that current estimates of temperature rises consequent on the increasing CO2 concentration could be an underestimate. This implies a big increase in cost to maintain the targeted temperature rise. A study in Nature Climate Change has already indicated that holding the temperature rise to 1.5°C could be three times as expensive as holding it to 2°C. There had been speculation that the relatively slow increase in temperatures of the last decade was a sign that model rates were too high. But this has also been looked at, with indications that the cooling effect of aerosols (particularly sulphur aerosols) and pollution from fires had been underestimated. Thus if Asian countries clean up their skies the warming could increase (despite any long term benefits). Other studies also point to this higher sensitivity view, including using the latest data on solar radiation, volcanic activity, the heat uptake of the oceans and aerosol volumes. One variable of interest is cloud behaviour in the different models and it is the models which now appear correct in their approach in this respect that indicate the greatest sensitivity to increasing CO2. Some models which have been used to show the conditions necessary for a 1.5°C increase can then be predicting 3°C. A further complication to these thoughts is the point at which equilibrium will be reached. There has been much focus on the temperature rise by 2100. What happens after that will depend greatly on the timing of the actions (assuming such are needed). The earlier action is taken the more likely the trend is to be level after 2000. However even if CO2 concentrations are limited to a particular figure there is a long tail of continuing consequences and feedback to play out – for example the continuing melting of continental ice sheets and changes in vegetation. Perhaps before we feel too self-righteous about what we might achieve by 2100 we should be thinking about 2200 and 2300.